Crispy garlic potatoes without deep frying? Yes you heard that right! Thanks to the invention of the air fryer, you are now able to have perfectly crisp potatoes without having to deep fry. Just chop the potatoes, add a little oil and seasoning, pop in the air fryer, and boom: perfectly crisp and tender potatoes. Serve these alongside eggs and bacon for weekend brunch or make them as a side dish to a roasted chicken. Any meal will be happy to have these potatoes! Try other herbs instead of the rosemary for some variety. 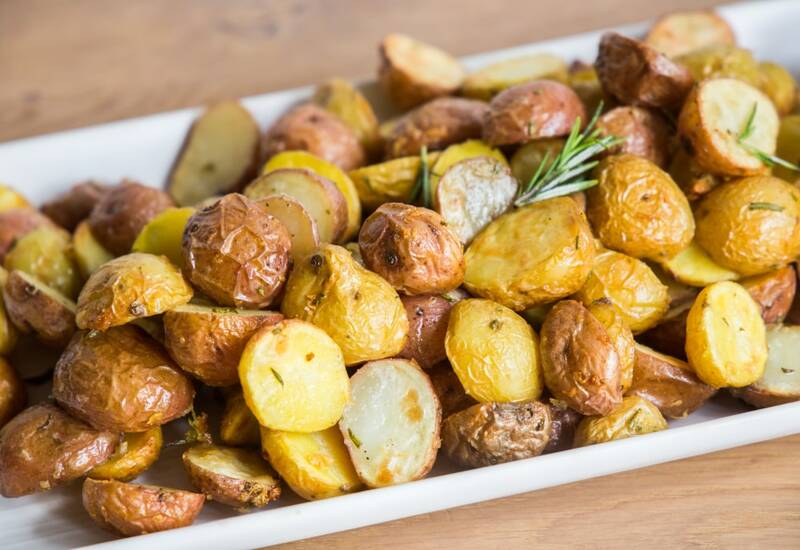 Fresh tarragon or thyme are a nice complement to potatoes. Sprinkle freshly chopped parsley on the potatoes right before serving for a fresh green pop. Grate Parmesan cheese, using a microplane, over the potatoes right after taking them out of the air fryer for a cheesy addition. Per Serving: 276 calories; 20g fat; 24.1g carbohydrates; 2g protein; 0mg cholesterol; 475mg sodium. I used thyme instead of rosemary. These are really garlicky and delicious. The garlic gets really crispy but not burnt like it would in the oven. Of course I would run out of garlic but I seasoned these potatoes with garlic powder and they were so good. Love the crispy skin. Definitely my new favorite snack, especially because they're ready in under 30 minutes.